A reporter at a Massachusetts-based newspaper resigned Friday after falsely claiming in a tweet Thursday that the man who killed five employees at the Capital Gazette newspaper in Annapolis, Maryland, left a “Make America Great Again” hat at the crime scene. 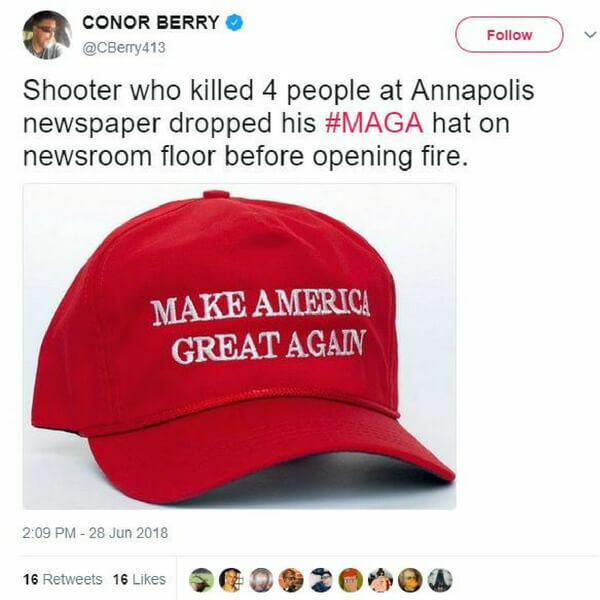 “Shooter who killed 4 people at Annapolis newspaper dropped his #MAGA hat on newsroom floor before opening fire,” Conor Berry, a reporter at The Republican in Springfield, Massachusetts, wrote in a now-deleted tweet. “We need to be more vigilant than ever to be fair and accurate in a climate in which we are scrutinized and criticized,” Wayne Phaneuf, the executive editor of the newspaper, said in a statement. He also lamented that his tweet gave more fuel to critics of the news media who believe reporters try to push a partisan agenda.